"The Final Problem" is a shocking tale, both for contemporaries of the Strand Magazine as well as for first-time readers of The Memoirs of Sherlock Holmes. Christopher Morley wrote: "Devoted readers have rarely had such a shock as the opening words of this story when it first appeared in the Strand Magazine." And so too did we. Some reflections on the drastic turn of events and of the reactions to readers around the world. Clive Merrison: [00:00:06] "It is of course a trifle, but there is nothing so important as trifles." Narrator: [00:00:11] Yes, the Problem was Final, the House was Empty and his Bow was Last, but there are so many other details to pick apart in the stories. Narrator: [00:00:22] You know the plots,but what about the minutiae? Why would the Pope engage Sherlock Holmes's services? Why did he receive the Legion of Honor from France? And why would he refuse a knighthood? Narrator: [00:00:48] Episode 16: The Surprise of a First Reading of the Final Problem. Scott Monty: [00:00:55] Hi there and welcome to Trifles, the Sherlock Holmes podcast where we delve into some of the nitty gritty details of the Sherlock Holmes stories. I'm Scott Monty. Burt Wolder: [00:01:07] I'm Burt Wolder. Scott Monty: [00:01:09] And are you - are you ready for this? Have you recovered from the Easter episode yet? Burt Wolder: [00:01:15] Oh there's just a few flakes of chocolate around my lips and we're just clearing up the eggshells. But other than that, it's all fine. Scott Monty: [00:01:24] Well you'll have to speak louder because I still have jelly beans in my ears. I don't know how they got there but we are we are through with -- which is interesting. We talked about the resurrection of Holmes - the Return - and the Empty House in particular. And now we're going back to look at the final problem seems a little out of order. We let the calendar dictate what we do and allow us to dictate what you do. Before we get into this, please leave us a rating or a review on the platform of your choice wherever you happen to listen to us. It would be very helpful if you told other people what you think of the show. Share this update with them of course show notes are available at ihose.co/trifles16. Feel free to leave us a comment there and we do appreciate the comments that have been flowing in. And as always, your support with Patreon or even PayPal would be very helpful just to help keep the show going. Over on SherlockHolmesPodcast.com. Scott Monty: [00:02:32] So let's talk a little bit about "The Final Problem." Do you remember the first time you read "The Final Problem," Burt? Burt Wolder: [00:02:41] It's vaguely -- you know I first encountered the Sherlock Holmes stories in the fifth grade through a volume from my school library and I remember that it was a big heavy book. I remember the illustrations in the book and I remember that the book ended with The Final Problem. 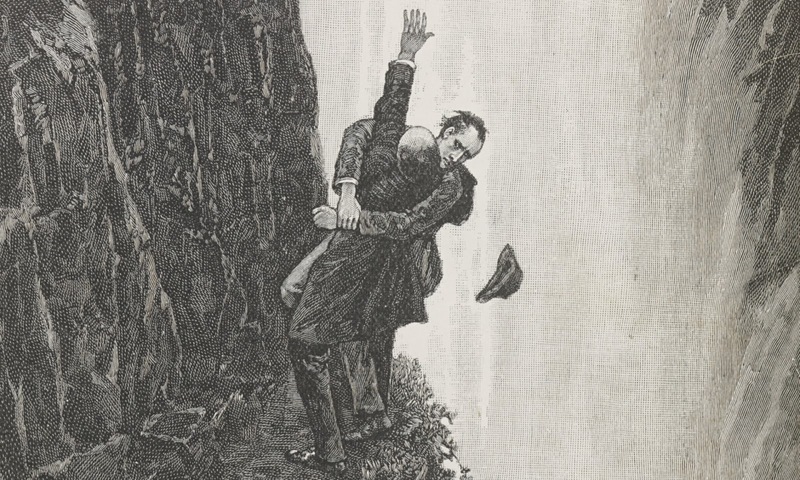 And I remember that it included that Paget illustration of Holmes and Moriarty entwined, hurtling over the falls. Yeah, I remember a keen disappointment for having just discovered this magnificent hero to - it seemed very rapidly to me - come to his demise. Scott Monty: [00:03:25] Had you had you read through all of the Adventures and all of the Memoirs at this point in kind of the book form? Burt Wolder: [00:03:34] Yes. Yeah. The book that I'd gotten from the school library included the Memoirs and I'm pretty sure included all-- I know The Final Problem was the last story -- so I'm pretty sure it included all the Adventures and Memoirs. Scott Monty: [00:03:49] Usually you know when you come across them in a classroom setting, you'll read one or two stories out of order. The Red Headed League and the Speckled Band are usually the two most common stories that are used to introduce children around that time frame fifth sixth seventh grade. Burt Wolder: [00:04:06] It could be too that my library had two separate volumes and they just got the first one I like it because they go on but I remember being one. One big book. Scott Monty: [00:04:14] Yeah. Well I remember and I still have a version of it having a copy of The Illustrated Sherlock Holmes, which was a reproduction of the pages of The Strand Magazine as they originally appeared with those Paget illustrations. And of course The Final Problem was published in The Strand Magazine in December 1893. And of course Sherlock Holmes and the Strand started their association in June of 1891. So this would have been over two years of uninterrupted Sherlock Holmes stories, and just about every month in The Strand Magazine. And all of a sudden we come upon this story -- which by the way is also one of these chronological amazing opportunities, or chronological instances where all of the chronologists agree: April 24th 1891 is the date of this story. And when when you're first reading it, the opening sentence may make grip you, but then you get into the adventure. Ah, that couldn't be. And it's not until you get to the end of the story that the full impact of it really begins to weigh upon you and the opening sentence or the opening phrase is: "it is with a heavy heart that I take up my pen to write these, the last words and which I shall ever record the singular gifts by which my friend Mr. Sherlock Holmes was distinguished." It's -- you know, Conan Doyle just had a way of gripping you of hooking you. And in our friend Christopher Morley remarked on this in his famous book Sherlock Holmes and Dr. Watson: A Textbook of Friendship. You want to read his excerpt? Because you do a great Morley. Burt Wolder: [00:06:24] Well it's easy to do a representation of someone who sadly passed away in 1957. There are a lot too many extant copies of his recorded voice bubbling around. But he writes in the textbook: "Devoted readers have rarely had such a shock as the opening words of this story when it first appeared in The Strand Magazine. The Adventures of Holmes and Watson had been running since July 1891 with only a few months vacation in the Summer of '92 for the author to think up new plots. Few characters of fiction have so immediately won readers' hearts and the sudden news of Holmes death caused consternation. A study of the files of the Strand shows the editor's attempts to console his readers by various substitutes and imitations. Doyle himself was bored with Holmes and did not relent until 1901 when the Hound began seriously serially in the same magazine. Scott Monty: [00:07:31] There it is and then of course Watson concludes the story saying he "endeavored to clear his memory by attacks upon him whom I shall ever regard as the best and wisest man whom I have ever known. Scott Monty: [00:07:54] Talk about finality. Burt Wolder: [00:07:58] And as we find out nine years later, not really so. But one of the things you know we should point out that really adds to the verisimilitude - the reality - of this particular story is a technique that we observed back in our discussion of the Speckled Band. In Watson's opening you remember the Speckled Band Watson's openings he says, "well you know the lady in question sadly passed on and there's been some recent commentary about the supposed -- the circumstances of the death of Grimesby Roylott, so I really must set the record straight..." Well here, Watson says "my hand has been forced, however by the recent letters in which Colonel James Moriarty defends the memory of his brother and I have no choice - no choice but to lay the facts before the public exactly as they occurred. I alone know the absolute truth of the matter and I'm satisfied that the time has come when no good purpose is to be served by its suppression." So you've got you know again this lovely additional -- this is really the truth is it wasn't my idea that this fellow's been writing these things now. Well now I'm going to set the record straight. Scott Monty: [00:09:07] Well and to hammer things home even further, Watson continues to say "as far as I know there have only been three accounts in the public press that in the Journal de Geneve upon May 6th 1891, the Reuters dispatch in the English papers on May 7th, and finally the recent letters to which I have alluded." Burt Wolder: [00:09:38] Now we've glossed over the fact that one of the great canonical conundrums occurs in the passages we just looked at. Which is the fact that there appear to be two brothers Moriarty both named John. Scott Monty: [00:09:51] And then there's a third one which we find later in the Valley of Fear, is there not? It was a station master. Burt Wolder: [00:10:00] Is there? I don't remember the station but I see one. Scott Monty: [00:10:05] Well we're assuming a station master and a colonel wouldn't be the same thing, right? Burt Wolder: [00:10:13] Right. Is there that specific a reference to Moriarty in The Valley of Fear? I don't remember that. Scott Monty: [00:10:18] Let me see. [00:10:23] I remember, you know the closing: "You must give me time, Watson" about addressing the evil of Moriarty But that places the case before The Final Problem, obviously. Scott Monty: [00:10:39] No, I'm drawing a blank on that one. Maybe I made that up out of whole cloth. Burt Wolder: [00:10:50] I like it. Sounds good. Scott Monty: [00:10:53] Oh here it is. This is "you told me once Holmes that you had never met Professor Moriarty." "No I never have." "How do you know about his rooms. Burt Wolder: [00:11:05] I've been there on three separate occasions. Scott Monty: [00:11:08] "You found something compromising?" "Absolutely nothing. That's what amazed me. However, you have now seen the point of the picture. It shows him to be a very wealthy man. How did he acquire wealth? He's unmarried. His younger brother is a station master in the West of England." Burt Wolder: [00:11:29] Oh right. OK. So there are three of them. Well wait a minute now. One was Curly, right? And then Curley died. And then it was Curly Joe. No then there was Shemp. Scott Monty: [00:11:40] Hey, that HUUUURRRTS! Burt Wolder: [00:11:43] This is the Shemp of the Moriarty clan. Scott Monty: [00:11:48] I love it. Larry Fine: [00:11:50] Hey Moe, mine hernia. Burt Wolder: [00:11:56] Well if you're going to talk about Hernia, we're back in Shakespeare. Scott Monty: [00:12:02] But let's think back let's get back on track here. The shock that a reader has when coming across this final story in the Sherlock Holmes stories you know whether it's in the Strand magazine and you were a contemporary of Conan Doyle reading this, and and reading that final line which seemed like it had a great deal of finality to it. Or whether you're -- you've got this collected edition and you come to the final story in it and you close the cover and that's it. Unless you have the complete Sherlock Holmes in which case you know there's about two thirds more of the book. You have to finish. Even so - even knowing that there are more stories to come for the modern day reader, it's still a great shock and a wave of emotion -- at least from my experience -- passed over me. How could this happen? Our hero was at the height of his powers -- was at the height of his career and now he's gone. Burt Wolder: [00:13:11] Well, you know there are a lot of -- I mean I don't want to trivialize it -- but there are a lot of contemporary echoes of that: it's the great shock and disappointment and unhappiness people had when Star Trek was canceled after its first two seasons all those years ago and look what happens. I mean, you become deeply entwined and you deeply enjoy the adventures of this character and then for no apparent reason, you come to a stop sign. And it's hurtful, yeah. Scott Monty: [00:13:49] And for the folks that lived through it the folks that didn't have a Sherlock Holmes story for what, seven years, until the Hound came out. And even then Watson was very clear that it was a retrospective not a resurrection. And then another nine years beyond that before the return came about I think is that right. Or no, another two years before the Return came out, that's a lifetime and the Strand magazine. You know this was its lifeline. This was the fuel that helped the magazine maintain its subscription numbers. Now we are told -- and there's never been any concrete evidence to prove this -- but the the urban legend is that when Sherlock Holmes was perceived to have died at the Reichenbach Falls, that Victorian gentleman began to wear mourning. They wore the black crepe around their arms and in a show of sadness and mourning obviously, and of solidarity. That's how much Sherlock Holmes crept into the public's imagination. Burt Wolder: [00:15:08] But we've never found any any confirming support for that. That may be an urban legend. And I notice that in Morley's writings he says well, you know from the standpoint of the letters of the editors of the Strand, it was clear they were trying to respond to their readers and suggest imitations and other things, so there's clearly some sounds like there's some support for that. But for the crepe armbands, perhaps not. Burt Wolder: [00:15:38] You know one thing that's never been remarked in all of the-- or maybe it has been, maybe I just don't remember it -- in the scholarship around the departure of Sherlock Holmes over the Reichenbach Falls is the the roots of that. You know, Conan Doyle, among many other things in his enthusiasms, popularized skiing as a sport and an activity and an exercise. And as we know Conan Doyle was also in later years more and more involved in psychical research and spiritualism. The society for Psychical Research that he was a part of included among its members Arthur Balfour and Balfour became prime minister. He was a conservative politician; he became prime minister of the UK in 1902. And there are a lot of parallels between Balfour's character - in particular his apparently, his desire not to physically exert himself that are reminiscent of Mycroft. But Balfa also had a younger brother -- Francis Maitland Balfour I think -- who died trying to scale Montblanc in Switzerland in the early 1880s. And so there's some thinking that says you know as Conan Doyle was in Switzerland and saw the Reichenbach and had the past experience of Balfour's brother dying sadly in that sort of mountain setting, he thought to himself what a great place to entomb this character. Scott Monty: [00:17:20] And it also explains why Conan Doyle preferred Parker Pens over Montblanc. Burt Wolder: [00:17:29] Yes - too deadly. Too dangerous. Scott Monty: [00:17:33] You'll put your eye out! Burt Wolder: [00:17:35] One slip and I'm gone. "Dear Lord Molesworth, Your No. 7 Broad is precisely what I've needed all my life. Arthur Conan Doyle." Scott Monty: [00:17:48] I think that will wrap that one up nicely. Clive Merrison: [00:17:51] It is of course a trifle, but there is nothing so important as trifles. Narrator: [00:17:56] Please join us again next week for another installment of Trifles. Show notes are available on SherlockHolmesPodcast.com. Subscribe to us on iTunes and be sure to check out our longer show I Hear of Sherlock Everywhere where we interview notable Sherlockians, share news, and go into even more depth on certain topics. Peter Barksworth: [00:18:21] You take my breath away, Mr. Holmes. David Burke: [00:18:25] It's with a heavy heart that I take up my pen to write these, the last words in which I shall ever record the singular gifts by which my friend Mr. Sherlock Holmes was distinguished. I shall ever regard him as the best and the wisest man I've ever known.